I’m now just over a fortnight into using Apple’s macOS Sierra, and I can report that it’s not enough time to get used to that name’s oddball capitalization. The past two weeks have, however, allowed me to come to some conclusions and form some questions about this operating-system update. The pleasant disk-space mystery: Both times I’ve installed Sierra–an uneventful 50 minutes on my 2012 MacBook Air, an absurd three hours and change on my 2009 iMac–the OS has rewarded me with multiple gigabytes of free space. The MacBook, which was getting so close to full that I had to delete several gigs’ worth of data to install Sierra at all, gained 17 GB, while the iMac got an extra 18 GB back. I do have the MacBook set to back up its Documents and Desktop folders to iCloud (neither contain enough data to threaten iCloud’s meager 5 GB quota of free space), but that comes nowhere near explaining the newly-liberated volume. And although Sierra doesn’t count “purgeable” files–synced files and media, rarely-used fonts and dictionaries, and other items that the system can always re-download after deletion–the totals of purgeable data listed in the info boxes for each startup disk don’t come close to explaining the discrepancy either. My iMac, however, is cut off from Universal Clipboard, as it’s a good three years too old. Once again, Apple: I’ll think about buying a new model when you don’t charge me 2016 prices for designs barely changed from 2014. Search snafus: On both computers, a search in the Calendar app for events that I know exist–like conferences I’ve attended every year since 2010–now fails to show results older than late 2014 in my Google-hosted calendars. Sierra knows these older events exist, because Spotlight searches still find them. A post in Apple’s tech-support forums cites an unnamed Apple rep as saying this is a bug that should be fixed, which I hope is true. I also hope somebody in Apple PR replies to the e-mail I sent Wednesday asking about this. Stuff I haven’t tried much yet: I know that Siri leads off Apple’s pitch for Sierra, but I only really need one personal-assistant app–and that app serves me best on the device I carry most often, my Android phone. I also have yet to try out Apple Pay on the Web, although that’s mainly a factor of me not buying anything online in the past two weeks aside from one quick Amazon purchase. The new auto-categorization features in Photos sound neat but can’t help the overwhelming majority of my photos taken on my Android phone, which never even show up there. The same goes for the souped-up conversation options in Messages (did I mention I use an Android phone?). pre-emptive multitasking” was one of its foundational features. It also annoys me that Photos persists in the user-hostile practice of discarding the title, description and location I added earlier to a photo when I try to export it to Flickr. Meanwhile, Sierra has broken the GPGMail plug-in I use to encrypt and decrypt the occasional e-mail–something I only realized after I’d installed this OS on both Macs. I e-mailed the developers and got a reply explaining that Apple made non-trivial changes to the Mail app’s internal code (I wouldn’t have guessed, since Mail seems as glitch-prone as ever) that they realized late in the game would require rewriting the plug-in. So if you were going to send me an encrypted e-mail critiquing this post, please hold off until they can ship a Sierra-compatible beta. Possible upside of Safari’s memory-hogging ways? Teaching me to appreciate inner peace. Sometime in the last year or two, my least favorite three-word phrase in all of computing became “Safari Web Content.” That’s the component of Apple’s browser that appears red in OS X’s Activity Monitor app–normally, you see the address of the Web page being displayed by this process–when it stops responding and starts locking up the rest of the Mac. 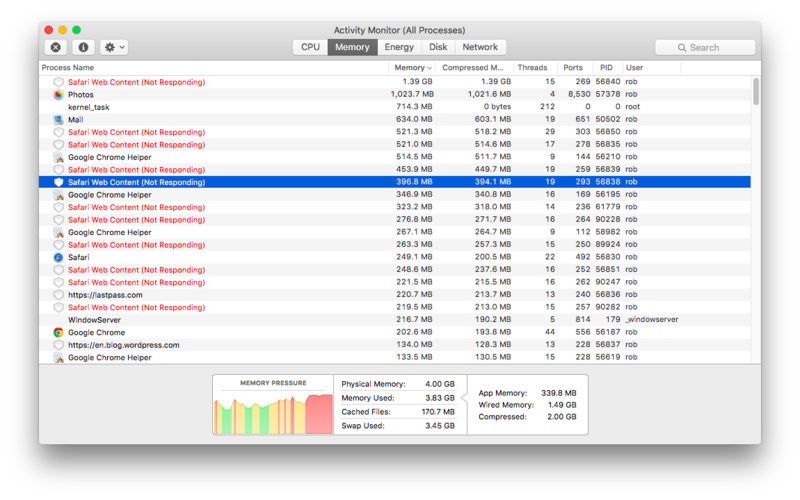 My usual routine when I see OS X once again seize up is to flip over to Activity Monitor–which sometimes requires a wait for Safari to loosen its death grip on the system–and start force-quitting the stuck Safari Web Content processes, if I’m not looking at a screenful of them. If I do see a screenful, I’ll force-quit the whole damn browser. This usually leads to lengthy bouts of swearing, about which I’m getting increasingly embarrassed. Yes, I work from home and nobody is around to object to a stream of curses (which was not the case in the Post’s newsroom; sorry, Posties), but I also realize I’m being an idiot. The computer has no feelings; it doesn’t care how many f-bombs I direct at it. And all this nerd rage can’t be good for my health anyway. 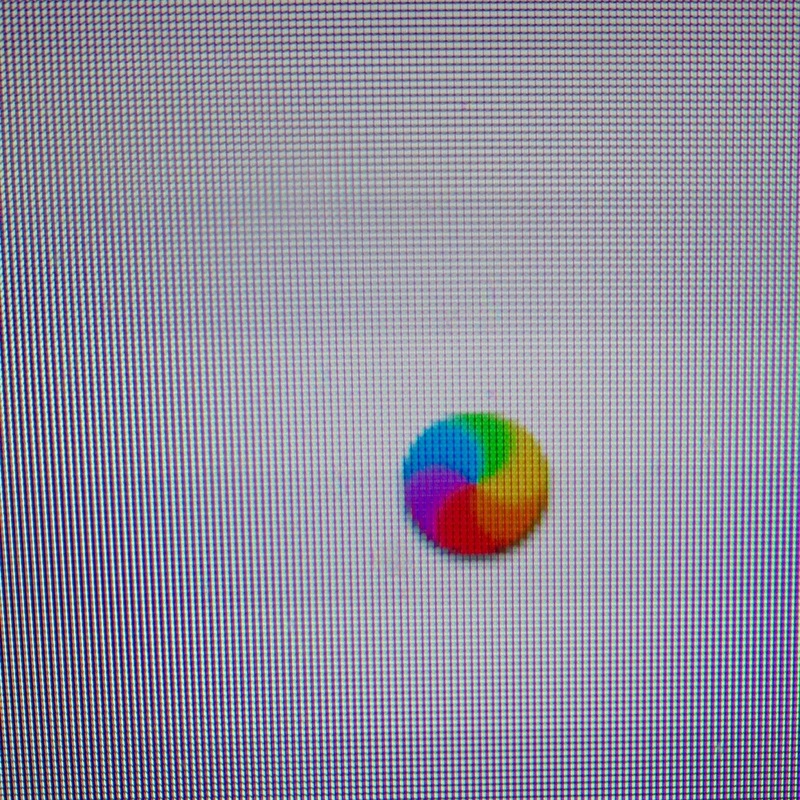 So while I wait and wait for Apple’s developers to bring their browser to heel, I am trying to learn to chill. To slowly inhale and exhale and to listen to the sound of my breathing, to look up from the screen so I can gaze at the trees and the sky outside, to stand up and stretch, to in general not give in to the Dark Side. Do you have any advice about how I might better do that? Please share it in the comments. I know, I know: Making fun of autocorrect fails is not new. But the automatic spelling correction in OS X is something else, courtesy of its apparent inability to figure out that my starting a word with a capital letter suggests I might be typing a proper name–say, a reasonably well-known online brand’s name–and that a little more deference would therefore be in order. You can argue that autocorrecting “Glympse” to “Glimpse” is fair game. But what about the following replacements I’ve seen OS X make? Meanwhile, it took a long time for Apple’s desktop operating system to stop auto-correcting Dulles Airport’s “IAD” code to “iAd,” as in the advertisement-serving system in iOS. People’s names are, of course, just as much fair game to OS X’s autocorrect. When I was live-tweeting the Federal Communications Commission’s net-neutrality vote, OS X kept trying to change FCC commissioner Mignon Clyburn’s last name to “Cleburne.” Perhaps it has an undocumented fetish for that Texas town of 29,377. BTW, who the hell is this "Cleburne" person that OS X keeps trying to auto-correct "Clyburn" from? I have to ask: Isn’t this the sort of bossy intrusiveness that an earlier Apple justifiably mocked during Microsoft Word’s Clippy era? 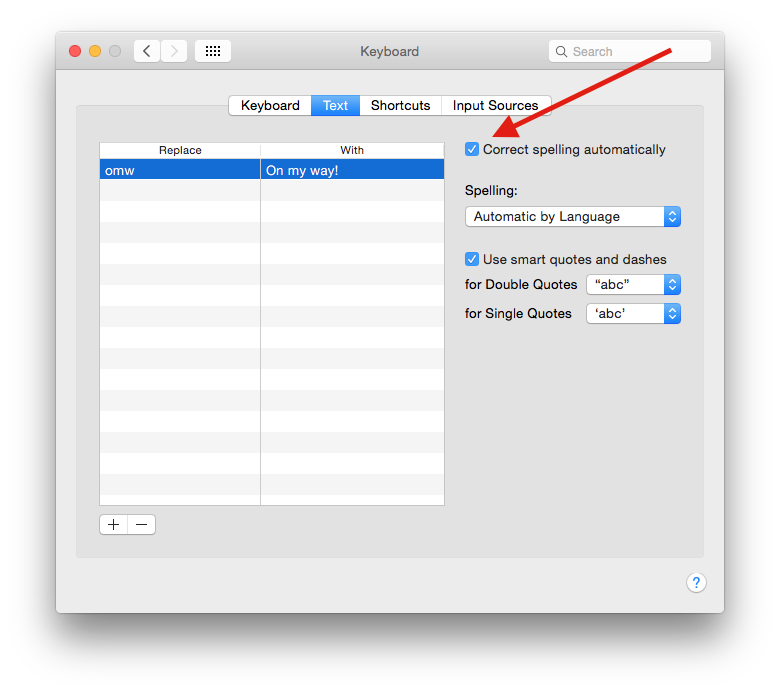 And then I must wonder: Why haven’t I shut off autocorrect already–in System Preferences’ Keyboard category, click “Text” and uncheck the “Correct spelling automatically” box–instead of whining about it yet again?